It’s hard to believe what happened on 9.11.01. It’s a day that changed our lives forever. Even my sons, who weren’t yet born. So much has changed since that horrible day. Who would have thought the term “post-9/11” would make any sense to us 10 years and one day ago. A lot of people are sharing their stories from 9/11. Where they were, how they were affected. My husband and I have watched a few programs on the building of the 9/11 memorial. Just watching these documentations brought back a flood of memories from that day. I remember being at my desk at the now-defunct alternative newsweekly, Casco Bay Weekly, in Portland, Maine. I was an advertising consultant. I was doing some paperwork. I didn’t have a computer there, so I wasn’t online. (Weird to think about working without a computer now.) I had my small desktop radio on when I heard about some sort of chaos in New York. The funny thing is that the reporters in the building seemed to completely disregard what was going on. As if it really wasn’t happening. Maybe it’s because we didn’t have much more than my little radio to rely on for news at that point. And that was spotty. We started to get calls with reports of a man with a gun near a local bakery. (Still not sure where that came from. It never happened.) Weird stuff was going on, and we didn’t quite understand it. It sounded like those that were reporting on the national news didn’t know what was going on. And they really didn’t. We knew that planes seemed to be crashing in horrible places. We didn’t know why. We didn’t know how. We didn’t know if more planes would go down. Suddenly no one felt safe. I remember visiting a client in South Portland. She was closing up shop, gathering her kids and going home. Schools were letting out. I don’t think I realized how much was happening until I finally went home and turned on the television. Actually, I think I was in denial for most of the day. The reports that were coming out over the radio were just too amazingly horrible to be true. I remember Tom Brokaw’s voice cracking as he reported that the Twin Towers had collapsed. 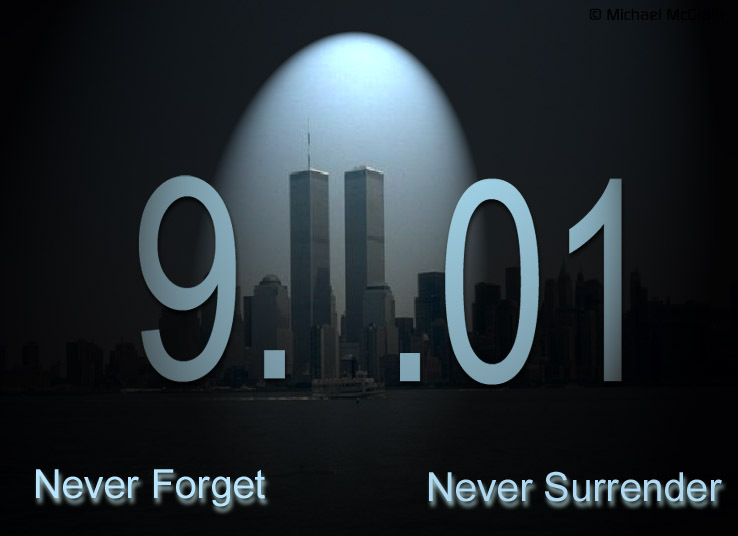 I remember watching the television the night of 9/11. It was the most horrible television I have ever witnessed, yet I couldn’t stop watching. I was searching for answers. Some hope. But that never came. There was so much sadness and destruction. People in New York were so desperate to find their loved ones, they were giving out their home phones numbers, addresses and all kinds of information in hopes that someone would see them on television and re-connect them with the person they lost. And there were the pictures of people plummeting to their deaths from buildings. There were no filters. It seemed to last for days. At some point, my husband and I had to turn the television off. We could only cry so much. It was a hopeless feeling. I remember the eery silence that came with the grounding of all airplanes. I never realized how much air traffic there was until it wasn’t there. I also remember how kind and caring everyone became. The day to day stuff seemed pretty unimportant. We were just trying to make sense of what just happened and wondered if we would ever be the same again. Of course, we’re not. We never will be. And for better or for worse, we will never forget. My plan was to sit G down and have the 9/11 talk with him this weekend. Nothing gets past this kid. He was bound to hear or see something about 9/11, and I wanted to explain things to him before he asked questions. He asks a lot of questions and demands details. He’s a pretty mature six year old. As long as I explain things, he is content. The problem was that I left the newspaper on the dining room table on Friday evening, and he saw the photos of the destruction of 9/11 on the front page. He had just come back from the store with my husband, and he asked what the photos were all about. We told him to get ready for bed, and that we’d have a talk with him. The three of us sat on his bed and talked about what happened on 9.11.01. We show him pictures of the World Trade Center before the Twin Towers were hit. He has been to New York, so we were able to give him some context as to how tall they were and where they were. He remembered the area with all the construction. Ground zero. We told him about the bad people that were on the planes that made them crash into the towers, the Pentagon and in a field in Pennsylvania. We told him about the brave people on Flight 93 that saved other people’s lives by fighting the bad people on the plane. We talked about how sad it was. How a lot of people lost their lives. We also talked about all the heroes that helped people on 9/11 and after. The policemen, the firemen, the doctors, the regular people that just did whatever they could to help other people. We talked about how we love America, and how we are protected by our military. Living near the Brunswick Naval Air Station, G understands the concept of the military. We talked about how some very brave Navy Seals punished the really bad guy that was responsible for 9/11. We talked about how we will never forget that day or the people that were lost. We showed him pictures of the new memorial at Ground Zero. We promised him we would take him there next time we visited New York. We all thought it looked like a nice place to remember the good people that were lost. G didn’t have many questions after our talk. He understood, and he appreciated us telling him about what happened. He gave us a big hug and kiss after the talk. Some day, I’ll have to have the 9/11 talk with my two year old. I’m not sure it will be as easy as it was with G.
For now, I will remember the day and hug my kids and husband a little bit tighter. Every year I say to myself, has it been that long? Really? It seems like yesterday. Which leads me to wonder if it will always seem like yesterday. So true. We’ll never forget.